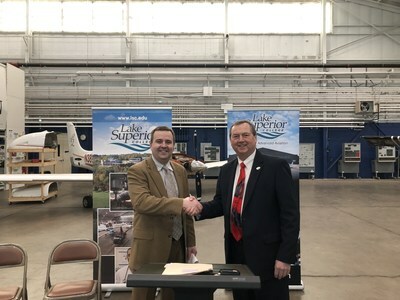 DULUTH, Minn., Jan. 24, 2019 /PRNewswire/ -- AAR (NYSE: AIR), a global, independent provider of aviation services, and Lake Superior College (LSC) announce expansion of their partnership to further enhance instruction and career prospects for students enrolled in the aviation maintenance technician program at the college's Center for Advanced Aviation. The new AAR EAGLE Career Pathway program will expand LSC's aviation maintenance technician (AMT) program to include job shadowing and mentoring opportunities, as well as academic support and monitoring. Students who pursue the Federal Aviation Administration (FAA) aircraft mechanic's certificate are eligible for up to $15,000 in tuition reimbursements. LSC President Patrick Johns and leaders from the community and technical college joined AAR's Ryan Goertzen, Vice President of Aviation Workforce Development, on Thursday for the official announcement at the Center for Advanced Aviation. AAR and LSC have collaborated since 2013 on marketing and recruiting, and to extend apprenticeship opportunities. "Lake Superior College and AAR already have been working closely together to serve our students and help prepare a highly-skilled workforce. This new EAGLE Career Pathway program will make our connection even stronger and offer increased opportunity for our students," said Dr. Patrick Johns, President of Lake Superior College. "EAGLE will provide additional marketing and recruiting opportunities and should result in more students enrolled in our program, give them a clear career path and provide additional resources to support their success." "We are proud to extend our current partnership with Lake Superior College to now include the EAGLE Career Pathway program. EAGLE partner schools like Lake Superior College provide additional training beyond the FAA minimums," said AAR's Goertzen. "The specific coursework developed by AAR with Lake Superior College focuses on repair station and air carrier operations, which allow for a smooth transition into AAR's workforce. Students will be guided through a five-year career path showcasing job opportunities beyond a technician, including roles in management and quality control." Lake Superior College (LSC) is a comprehensive two-year community and technical college in Duluth, Minn., offering more than 90 programs, including liberal arts and science courses for transfer, technical and trades programs, allied healthcare and nursing programs, and continuing education and customized training for business and industry. LSC is a member of the Minnesota State Colleges and Universities system. With total enrollment of approximately 10,263, LSC is northeastern Minnesota's largest two-year college. LSC is also a leader in online courses and programs in Minnesota, and offers competitive DIII athletics including soccer, basketball, clay target and cycling. More information can be found at www.lsc.edu. Media contact: Daniela Pietsch, Vice President Corporate Marketing & Communications, at editor@aarcorp.com or +1 630-227-5100; Program contacts: AAR, Ryan Goertzen, ryan.goertzen@aarcorp.com, 918-576-9981. LSC, Daniel Fanning, daniel.fanning@lsc.com; 218-260-3597.